Yesterday I dropped the podcast I did with Matt Lawson, fellow Kokoro Graduate. You can find an article and all links to the episode here. If you like it, could you please take a second and give it a rating and review on iTunes? It would help greatly. After a LONG trip to the Florida Keys. to film our show and get a few podcasts, I am back and training with my friends at the RRL. It is so nice to be surrounded by positive people pushing each other to be better in every area of their life. I came across this great video from the guys at SealFit. All of these guys and ladies are Kokoro graduates and offer some outstanding advice. If you are considering Kokoro, please watch this video and pay attention to the details. Below, I will give you what I did and where I think you should be 30 and 60 days out for Kokoro. I agree with their advice and I can offer a little more from the perspective of an older athlete going into this event. At 60 days out you should feel pretty confident in everything. Use the published standards as a guide and then add 30-40 reps on top of the published standard as a minimum guide to progress. At 60 days out, you should be increasing your weekly mileage of running considerably while avoiding injury. Every day, you should be training in the boots and pants you will use at the event. I was doing Opwods 3-4 days a week, running focused work 2 days and rucking one day...long. 30 days out, your gear should be dialed, your feet should be hard and you should be prepared for extreme workloads of 2-3 hour constant workouts. I did the 5 miles/1000 Burpee workout, Triple Murph and lots of other challenges before the event. You should feel comfortable with a 10 minute, no movement plank and be able to do Murph weighted at any time. At 30 days out, you should have all the work done that you need to survive the event. It is important at this time to try to heal up any injuries that you have and show up to the event healthy. Showing up healthy is of major importance to all athletes, but to the older athlete, like me, showing up compromised is not at all what you want to do. Show up healthy, strong and plan far enough ahead that you are not in a panic 30 days out, rather you are starting your taper. I graduated SealFit Kokoro 30 in October of 2013. It was a deeply powerful experience that has transformed my life in many ways. Very few days go by that I do not think about the camp, the friends I made there or the lessons learned. It is extremely exciting to me when one of my friends wants to experience this for themselves. Recently, Matt Lawson decided to give it a go and has just returned from Kokoro 40. Having successfully passed and graduated, I am excited to learn much more about his experience. We will start with this interview, but hopefully we will return to discuss more with Matt about how he is using Kokoro in his everyday life. TR-What kind of athletic background do you have? ML-I grew up playing basketball, football, baseball and golf. I played basketball and golf in high school. I received a golf scholarship for college. I worked out regularly from college to age 28. From age 29 to 38 my workouts were spotty and inconsistent at best. At age 39 with our second child being born in March of 2013, I decided it was time to step up and make a change. ML-I was randomly searching the internet in May of 2013 for something different than the typical bodybuilding workout. I was looking for a philosophy that incorporated more than just lifting weights. TR-Have you done any other events like this? Maybe a 20x, Goruck or other events? ML-Yes. I completed a SEALFIT 20X Challenge in November 2013. I ran the Ragnar overnight trail runs in 2014 and 2015. I ran a Marathon this past March in Knoxville. TR-Why did you choose to do Kokoro? ML-When I first read about Kokoro on SEALFIT’s website I was very interested. I wanted to challenge my mental toughness. You really don’t know until you step up. I wanted to see if I had what it took to make it through 50 plus hours of mental and physical stress. I also thought this type of event would be a good example to use for our children to show them that anything is possible if they are willing to put in the work and follow thru on their commitment. TR-I can remember the moment that I made the commitment to do Kokoro. I put my credit card info into the website and hovered my finger over the submit button. Finally, I presssed the button and knew there was no turning back. What was your decision like? What challenges did you have at home? Work? ML-I made the commitment to myself the first time I read about it in May 2013. I just had a lot of work ahead of me. My wife, Megan was hesitant at first. She wanted to know what the point was in subjecting myself to something as demanding as Kokoro. As time went on she became very supportive and encouraging which helped tremendously. My business partner, Bill Winchester was great through the entire process especially with the amount oftime that was required to properly train for Kokoro. My home and work environments were very supportive. I am very grateful. TR-Kokoro is not something that you can just do without significant physical and mental preparation. What did your training look like? ML-My morning workouts were at the RRL. I did SEALFIT OPWODs in the afternoon and Saturdays about 4 months out from Kokoro . I also did lots of running and rucking. ML-Yes. There is always room for improvement but overall I felt pretty good. I read as much as possible about Kokoro. I really appreciate the information that you (Tom Rowland) shared with me about your Kokoro class 30 experiences. That was very helpful. Also having the support from friends and family goes a long way. Especially when you are cold, wet and sandy. TR-What one thing were you the happiest that you had done in training? ML-Run, run and run with BDU pants and wet boots. TR-What one thing would you add to the training? TR-My experience was filled with many high points and lots of low points, but I can clearly remember several that stand out as the highest of the high or the lowest of the low. Did you have a noticeable high point in the camp? How about a low point? ML-I felt unstoppable early Sunday morning after about 35 plus hours on the beach carrying my 50lb rock up and down countless stairs. It was amazing and a testament to what we are all truly capable of accomplishing once we conquer our minds and remove the limitations that we place on ourselves. Of course when Coach Divine said we were secured after 52 hours of work that was very special too. This was the culmination of 2 years of intense training, focus and sacrifice. ML-It was Friday night after a 27 mile ruck up and down Palomar Mountain under significant load. We were all cold, wet and sandy bear crawling 200 yards up and down hills along with other drills that pushed us beyond our perceived limits. The intensity and pace were relentless. Then came the countless rocking chairs in the lake coupled with the cold winds. It was tough but that is when we started to come together as a team. Our communication improved greatly and we started focusing on the person beside us. That was an awesome feeling. We still had a long way to go but that was a big first step. TR-What was your diet like in preparation? ML-Fat boy special with extra protein and creatine. TR-Between the lack of sleep, cold water or endless running and rucking, which was the most challenging? ML-All of those represented their own unique challenges. 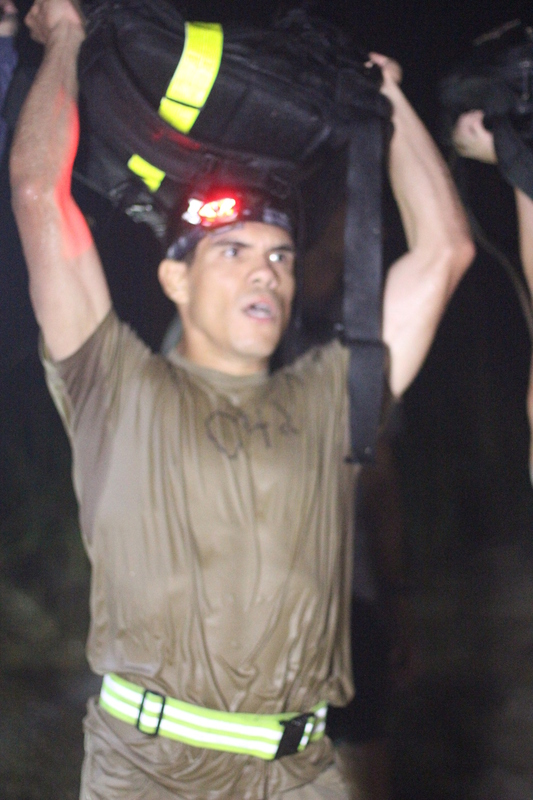 The rucking under load plus carrying additional objects at a fast pace over a long distance was challenging. TR-What one lesson will you take back to your personal life? ML-I learned countless lessons through the pain and suffering. We are all capable of 20, 30 times more than we think is possible. We have to remove the self-imposed limitation on ourselves. Teamwork is the key and lifting each other up with positive reinforcement is everything. We are so much stronger together than as individuals. 100% effort, 100% of the times. We will all need assistance at one point or another and we should be quick to reach and lift up each other. A positive gesture or comment goes a very long way in helping your teammate and yourself. Always be positive and encourage others. Kokoro is very special and I can draw upon the lessons learned for the rest of my life. TR- 50 hours of non stop exercise makes a person hungry. I can remember eating a TON of food, ordering 3 milkshakes at once, eating 3 hamburgers and then going out for dinner. What did the next 24 hours look like for you and your diet? ML-My first meal after being secured was the buffet spread SEALFIT provided just off the grinder. It was chicken, beef and barbeque tacos and rice. Plenty of extra sides, fruitand desserts. They had beer and just about any other beverage you can think of. It was really cool because all the coaches and interns stayed and ate with us. It was fun. That lasted for a couple of hours. I went back to my room and slept for about 5 hours then ate a large pizza and went back to bed. The next morning I killed some waffles and eggs. I drank tons of water. I really could not eat enough for about a week after the event, my body was so depleted and broken down. TR-What one thing would you take to Kokoro? ML-Since I had consulted you before leaving for Kokoro, I was very prepared on what to take. The towel came in very handy. The funny thing is we traveled and packed like Spartans, meaning coach Cummings had us place a couple of pairs of shorts, BDU’s and tee shirts along with our running shoes in a plastic garbage bag. We were wearing boots, BDU pants and tee shirt. We left SEALFIT HQ Friday morning with only our garbage bagsand traveled to some remote mountainfor the first 24 plus hours of evolutions. TR-I saw some amazing things in my camp. Was there one thing that you can remember as the most impressive thing that you saw someone do or endure? ML-There were several things that impressed me over the 52 hours at Kokoro. Teammates breaking down only to be picked up by others and come back stronger than before. The overall support and encouragement from all team members is hard to put into words. It is truly amazing what we all can accomplish when we remove ourselves and focus on others. The class was constantly rallying around teammates to lift them up, not to their load but to provide words of encouragement. All that being said, there was one situation where the coaches wanted to drop an individual. They put it up to a vote. We voted to keep him. That was not good enough, so the coaches said if there was anyone in our class that can complete the “FRAN” in less than 3 minutes then the individual can stay for now. One of our teammates stepped forward and after roughly 20 to 24 hours of evolutions (while being cold, we and sandy, no sleep) he completed the “FRAN” in 2:48. To say it was impressive is a gross understatement. The coaches were speechless, which as you know is rare. TR- Congratulations on completing Kokoro. I look forward to seeing how you incorporate the lessons you learned into your everyday life. Hooyah! Looking through the old blog, I came across this post. Recently, I have received many emails regarding SealFit Kokoro from people who are either considering doing it or are already signed up. For that reason, I am going to publish this post again on this newer blog. There is nothing all that special about it except that it captures the excitement and nervousness that I had when I decided to sign up, alone, for SealFit Kokoro. This decision turned out to be an excellent choice for me. Maybe this post will help others who are struggling with making a choice to challenge themselves. My advice: DO IT! SealFit has had my interest for around 3 years. Over that time, I have considered going to the Kokoro camp and also tried to arrange a 20x challenge in Chattanooga for me and all my friends. For lots of reasons and conflicts, I have not been able to make this happen. On Thursday, I was talking to my wife about our fall break plans. Our 3 children go to 2 different schools and their fall breaks overlap but are not the same. While discussing the plans I noticed that there was also a gap where nothing was scheduled on Oct 26-27. These were the camp dates. I asked my wife if it would be ok if I went and she said yes, my kids thought it would be cool and all of the sudden I had the green light to go do something that had been a dream of mine. Excitement, motivation and fear all were experienced at once as I completed the online application and hit the submit button. I was in now, no turning back. “We have published updated Kokoro Camp Standards to help you understand just what you are getting into when you start your training for Kokoro. We don’t want there to be any confusion as to what we are doing here. This is not a “SEAL experience” alone…it is an event unlike any other that will test you to your core. We want to prevent injuries as well as people holding their team back. The work-load at Kokoro camp was described by an Iron Man athlete as “3 back to back Iron Men races, without rest.” Prepare well. 50 push ups (40 for women) in 2 minutes, 50 sit-ups in 2 minutes and 50 air squats in 2 minutes, with 2 minutes rest in between each. Two event failure (PFT/Murph) will result in drop from course and refusal to perform any event will be considered a non verbal drop. Note we highly recommend that you ramp up your endurance and stamina training. A standard CrossFit or SOF Prep training regimen will not suffice. You should run a marathon or half Iron Man and spend considerable time rucking with load. Please contact us if you are not clear about the physical demands of this program. Should you fail to meet the standards and are rolled you will receive a certification of attendance, not a Certificate of Graduation with accompanying SEALFIT Black Shirt. You will be invited to train with your new knowledge and come back to challenge Kokoro Camp again in the future. 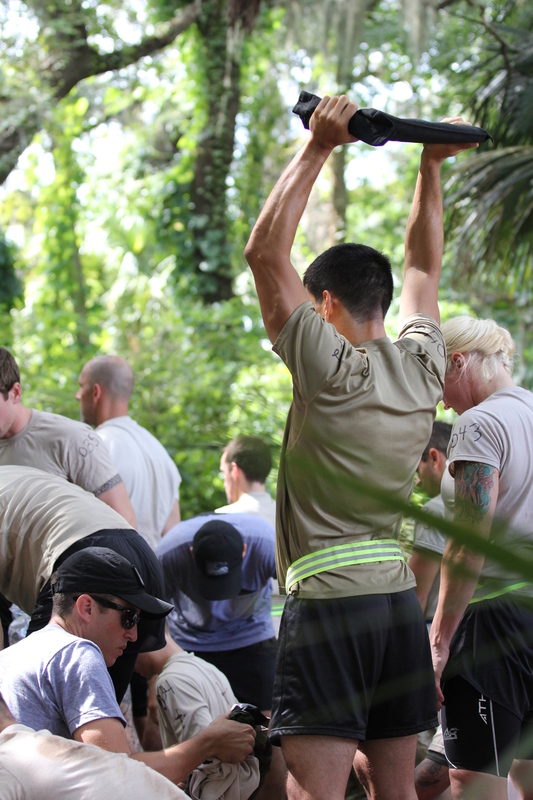 Black Shirt graduates have the potential to pursue intern positions and the SEALFIT Mastery program, as outlined on our web site. I am capable of all the physical standards at present, but I know I have ALOT of work to do before Oct 26, particularly in the rucking area. I felt as though I did not prepare enough for the Goruck and told myself that I would spend ALOT more time under load preparing for the next event. My running is not up to par either and I need to increase my mileage greatly and be confident running 12-15 miles without problem. My plan is to continue my morning workouts with the guys 5 days a week, but also throw in additional work in the day of 10 mile rucks, 10 mile runs, lots of plank work, weighted dead hang pullups, sled pulls, hill sprints and lots of walking lunges. I plan to do all of this in boots and tactical pants to break in both and get used to moving in pants and boots. I signed up through a link of Brad Mcleod’s www.sealgrinderpt.com site which included free coaching from Brad up to the event. I need all the help I can get, so I immediately sent Brad an email to which he responded right away. Brad suggested that I send him my benchmarks and also my time from a 1 mile sled pull.